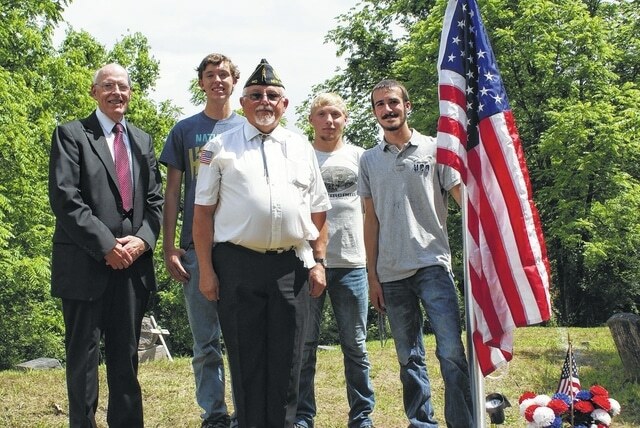 A flag raising ceremony was held at Brown Cemetery in Hartford Sunday signifying the completion of a reclamation project by three senior boys from Wahama High School. Pictured from left are Kenneth Vickers of the Smith-Capehart American Legion Post 140 of New Haven; Chris Rizer, who initiated the cemetery cleanup; Legion Commander David Sigman; Jacob Petry; and A.J. Howard. The boys, along with other students, have worked almost four months getting the cemetery back into shape.